I have to admit – the Video Thumbnails plugin from Sutherland Boswell is one of my favorite plugins of all time. When you embed a video from a place like YouTube, this plugin goes out and finds the thumbnail for it, downloads it to your site, and then automatically makes the thumbnail the featured image for your post. This allows that thumbnail to be used to represent that post wherever your theme uses thumbnails in that way. And it does all this automatically. It should also be noted that if you embed multiple videos in the same post, the plugin will get the thumbnail for the first video. 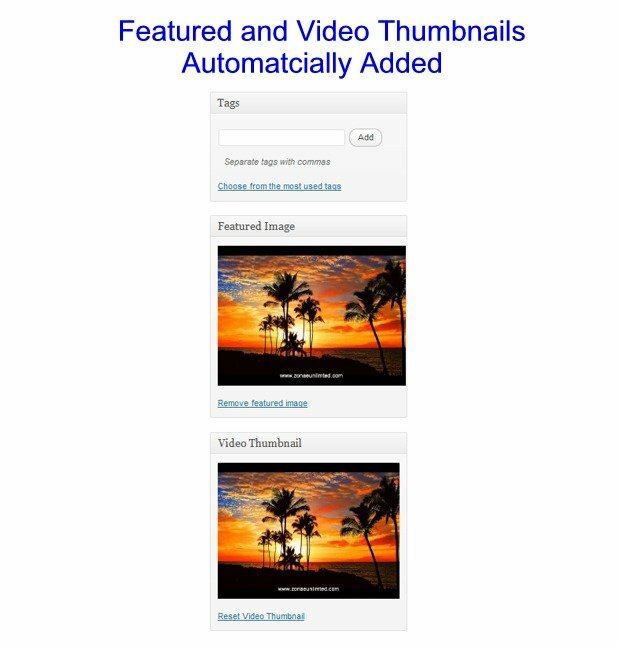 When the plugin uploads the thumbnail to your site, you will see a representation of it in your “Featured Image” section and in a new section called “Video Thumbnail” on your Write/Edit screen. There are a few settings that you can play around with, but for most people, the plugin will do everything they need it to do straight out of the box. The plugin also works with custom post types and custom fields. What if you didn’t have a plugin such as this? Let’s look at the process you would need to go through. Step 1: As thumbnails for videos on video-sharing sites are not easy to find, in order to get one for your site, you would first need to take a screenshot of the video itself. Step 2: You would then need to edit the screenshot in an graphics program to get it the right size. Step 3: You would then need to upload the edited screen shot as a featured image. Total Time: If you got good at this process, it would only take you maybe five minutes. Now let’s look at the process with the Video Thumbnails plugin. If you embed videos on your site and you use a theme that takes advantage of thumbnails, then this is a plugin you should definitely have in your arsenal. You can find the Video Thumbnails plugin here.